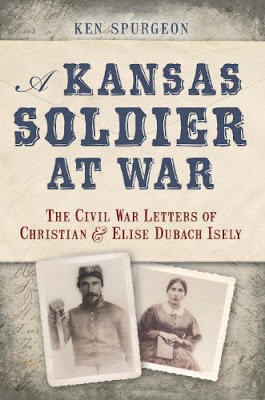 Local historian, author, and filmmaker Ken Spurgeon will be reading and signing from his new book A Kansas Soldier At War: The Civil War Letters of Christian and Elise Dubach Isely, on Thursday, August 22 at 6 p.m. Spurgeon’s documentary Bloody Dawn currently plays for visitors in the Museum’s Civil War exhibit, and the filming of his latest movie Road to Valhalla will wrap up this summer. Spurgeon is the president of Lone Chimney Films. Please join us for this event. Admission for lectures is free for Museum members or general admission for non-members. Students with an ID are only $5 (+tax). Please visit our website for more information or call the Museum at 316.263.1311.